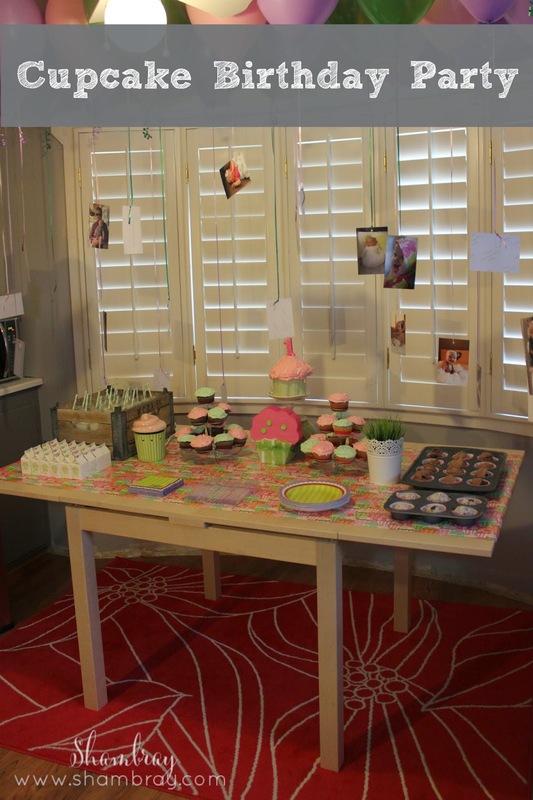 This birthday party happened almost a year and a half ago! Where has the time gone? My baby is growing up! 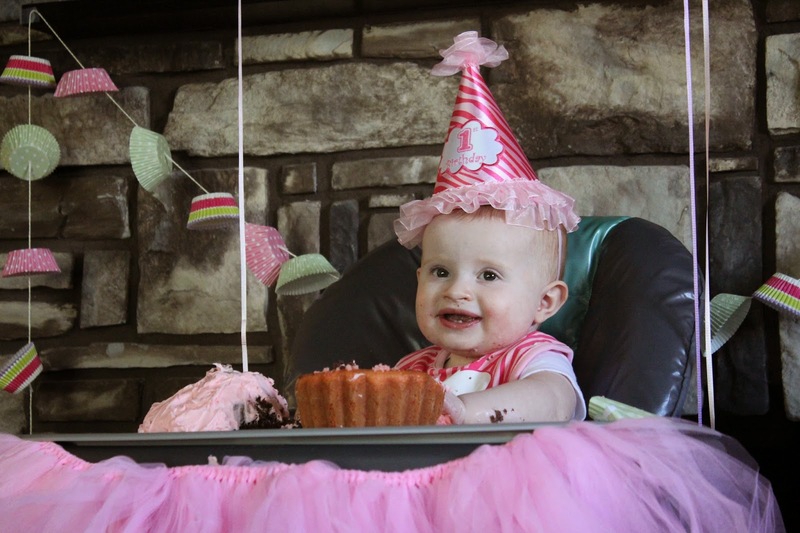 When she turned one I decided to throw a birthday party centered around cupcakes. I loved how it turned out. I made the invites with an embossed card that I had purchased years ago. I then chalked the embossed parts. 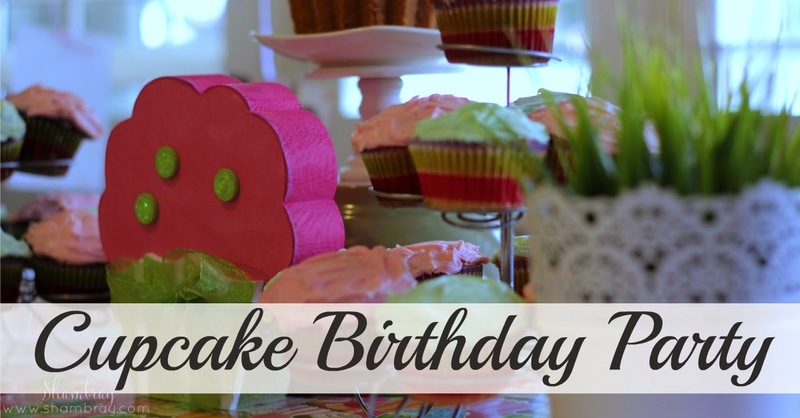 I used Stampin Up's "Create-A-Cupcake" stamp set (discontinued, but they got a very cute new one in, see here) and I used the Cupcake punch to make my life much easier! Ryan and I blew all these up by ourselves. Can we say exhausting? I remember it like yesterday because we were house hunting at the same time. So we were talking about houses and blowing up balloons all night. I then tied them to fishing line and attached them to the ceiling. You will save a lot of money on helium if you do it this way. Attach them to the ceiling with something that will come off easy. I know from experience. I think it turned out very cute. 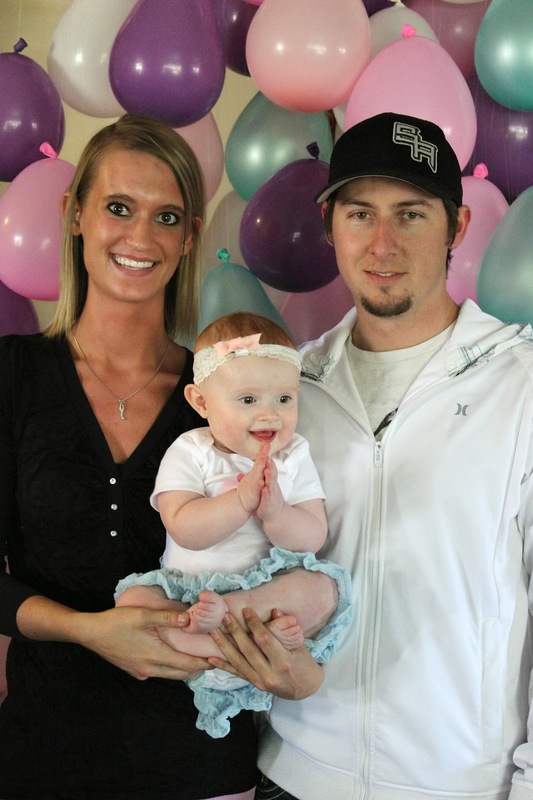 We took a picture with her and everyone of her party guests. The memories are awesome! This picture cracks me up because she is in such a funny position. So. Very. Easy. I just threaded cupcake liners through bakers twine. I taped the liners in place to the twine so they wouldn't move anywhere. I loved this touch because I love garlands and this was perfect for the theme. I borrowed this pan from a friend. You make the cake in the pan and turn it over to get the two pieces to fall out. I cut a little off each piece so they would sit flat on each other. It turned out so cute! 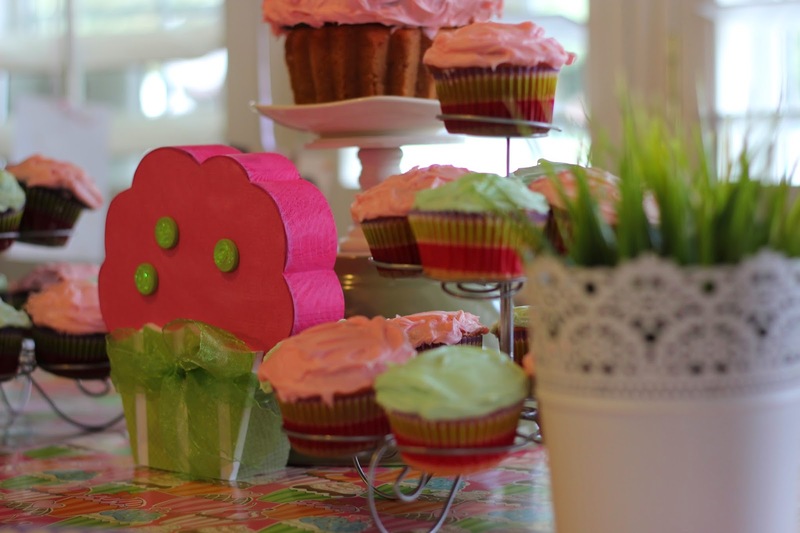 I wrapped the bottom part in scrapbook paper to act as the cupcake liner. 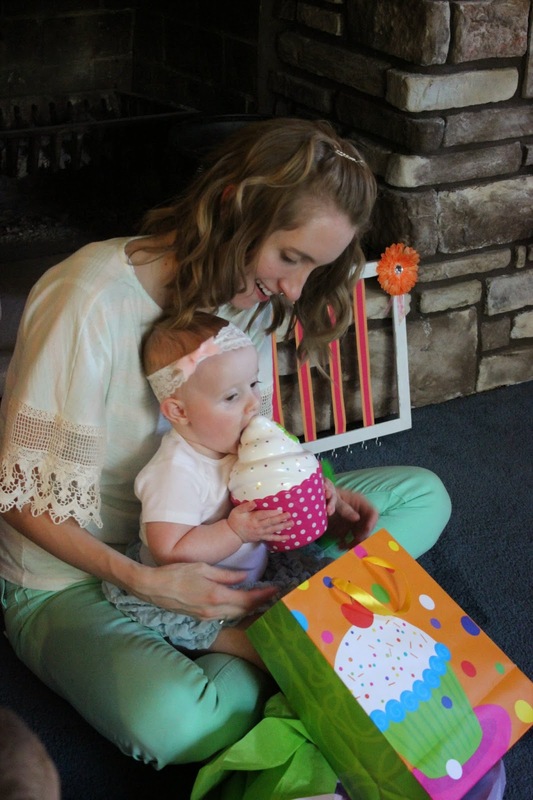 Hannelore was a little intimated by the HUGE cake in front of her, but other than that it was a success. This picture doesn't have the scrapbook paper on it yet. See other pictures for that. The milk bottles were borrowed from my mom. I absolutely loved this touch. I loved the box they were in to so I left them in the box to add to the decor. I put the paper straws in each of the bottles to eliminate one more things on the table. I did party favors of Hannelore's favorite thing in the whole world...Goldfish! 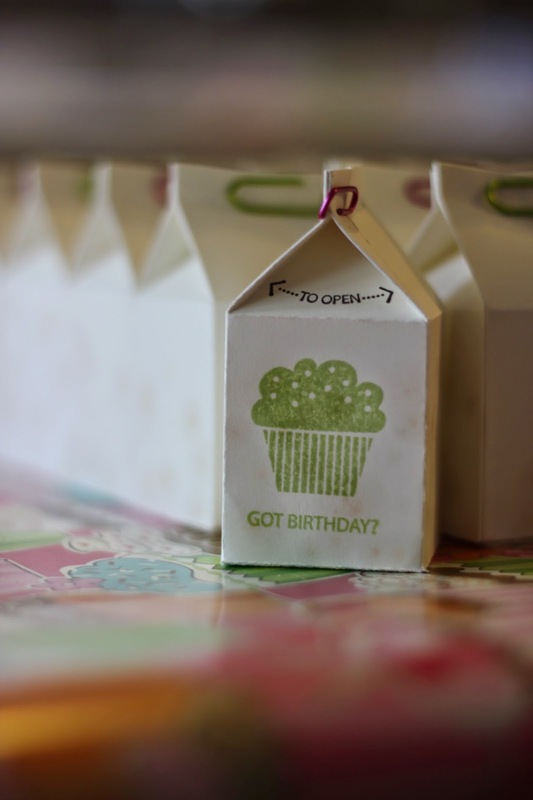 I cut out the milk cartons using the Big Shot from Stampin up. They used to carry this die, but they don't any more (similar). I folded them and closed them up. 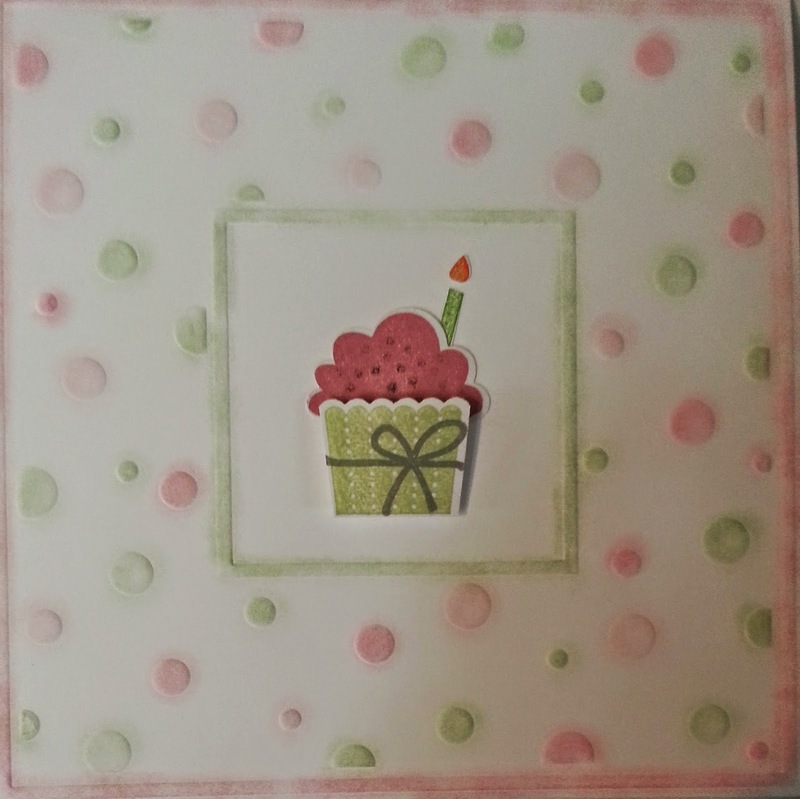 I also Stamped them with the "Got Birthday" stamp set from Stampin Up and of course they do not carry it anymore. 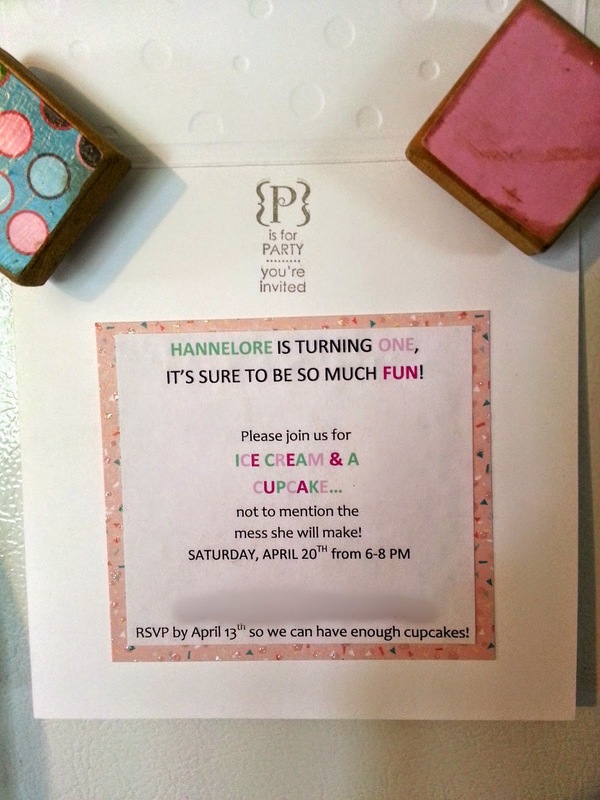 I loved that everyone could get a favor and that it was something Hannelore loved. It also helped that it was packaged in a cute way! All these came from Hobby Lobby. My favorite store by the way. Well one of them. 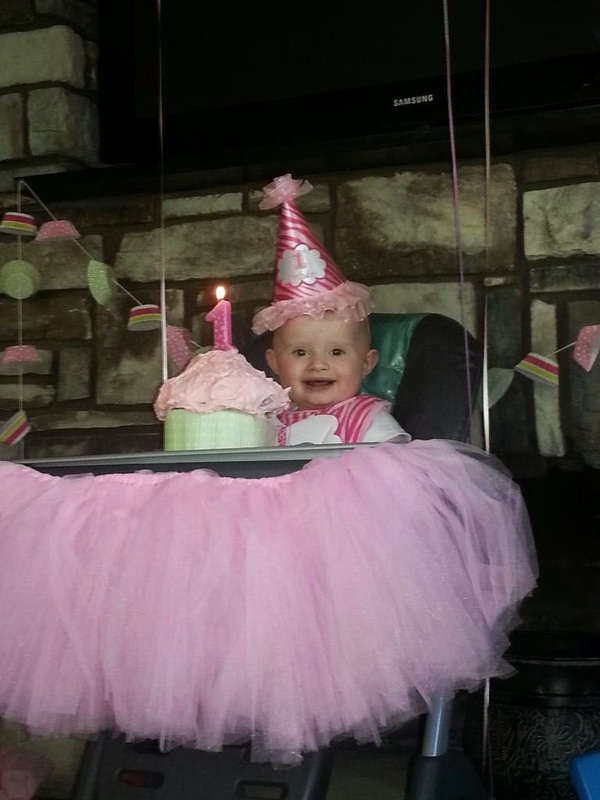 See them here: hat, high chair skirt, and bib. The onesie I made with a plain white onesie and then I got an iron on of a cupcake at Joann Fabric. The skirt was made from part of the Ikea Ofelia Blanket . 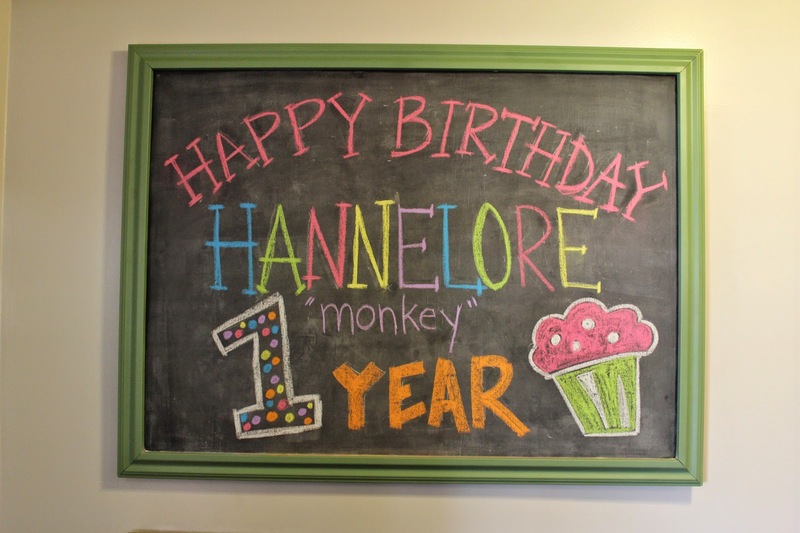 Ryan's aunt who helped me with decorations for Ryan's party and helped me wallpaper sewed this for Hannelore. She is one talented lady! She made it for me and then I dyed it with Rit Dye! I love how they turned out. 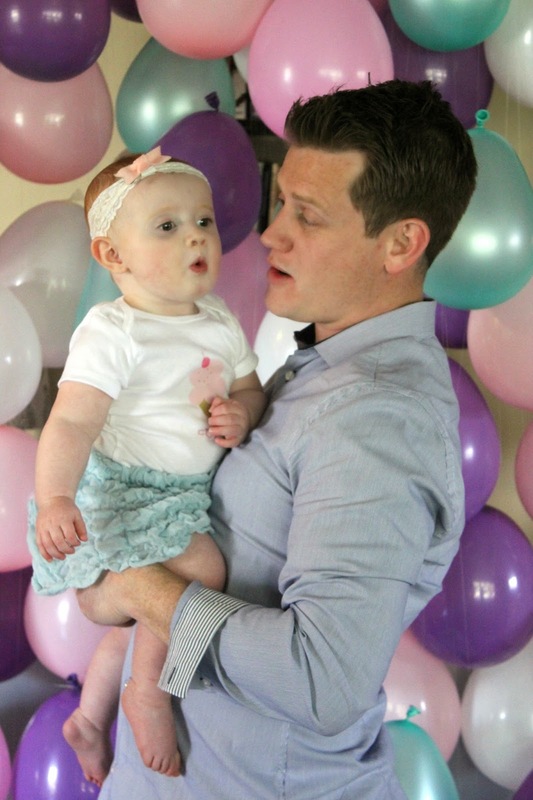 I had balloons filled with helium and then I printed pictures of Hannelore's first year of life. I then punched holes in them and hung them from the strings attached to the balloons. 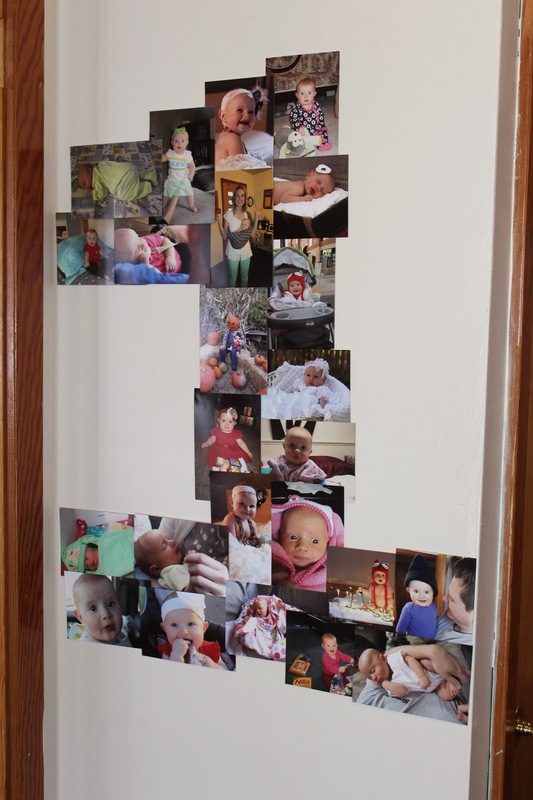 I love pictures so this was a fun and creative way to display them. Everyone loved looking at them. So easy! I just printed a bunch of pictures and used tacky to attach them to a wall in the entry way so everyone would see them. Again I love pictures so there was plenty to display. I LOVE CHALKBOARDS! I love the way they look and I love art on them. My husband is very artistic so he drew the artwork on there (he also did the artwork for her 2nd birthday party). I loved it so much that I kept it up for months. I seriously never want her to grow up! I cannot remember who I heard about pre-scooping the ice cream from, but it is genius! I pre-scooped all the ice cream and placed them in cupcake liners in a cupcake pan. I then placed them in the freezer and when I was ready for ice cream I just took out the pan. It made life so easy. It was also nice to have them in the cupcake liners to go with the theme. The wreath I made was from an SEI kit that I had received already. At this point in my life I was not crafting much so this helped me to get some of those kits done. I ordered the cupcake holders from a Groupon. They worked perfectly. (Similar). I made the cupcakes from a cake box and I made chocolate and yellow cake mixes to hopefully please everyone. I made the frosting two different colors to make it more fun. My mom helped me with those. I seriously have the best family! The straws I bought from Jane.com . That website deserves a blog post itself; love it! The rest of the supplies were purchased from Hobby Lobby. Unfortunately, they do not sell the cupcake plates, napkins, or even wrapping paper. 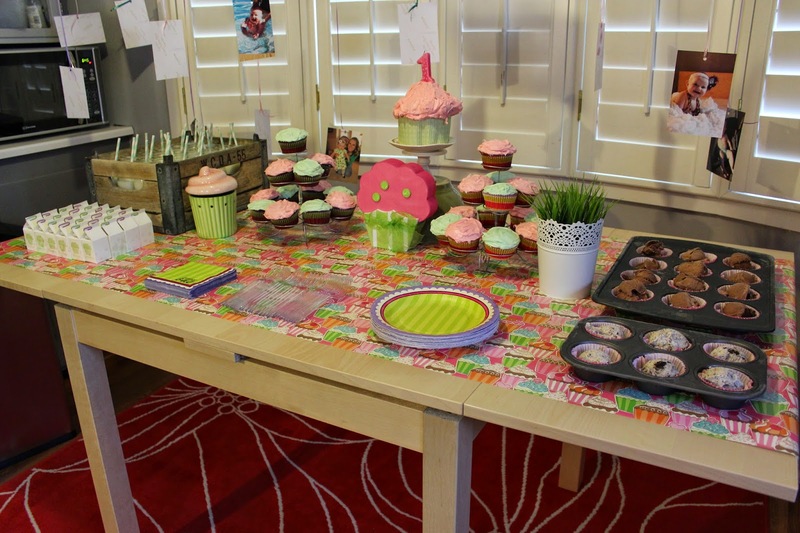 I used the wrapping paper to put on the table. It acted as my table runner. I liked how it turned out. Find similar: here, here, here, here, here. I still cannot believe this was more than a year ago. Time flies! 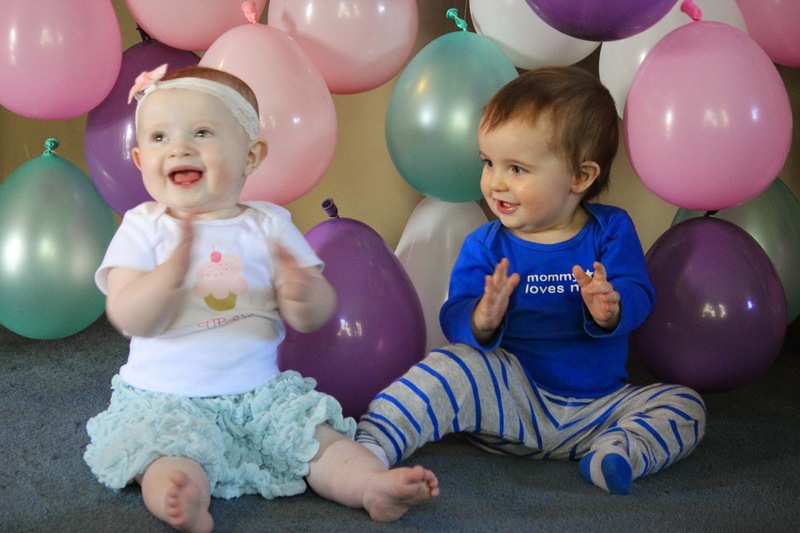 Cute cousins! Clapping so I couldn't get a non-blurry picture. 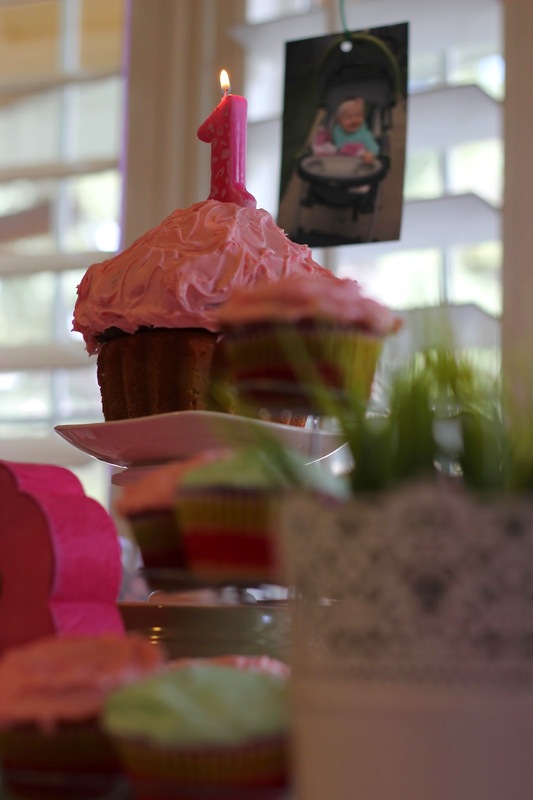 She wasn't afraid of the piggy bank cupcake. 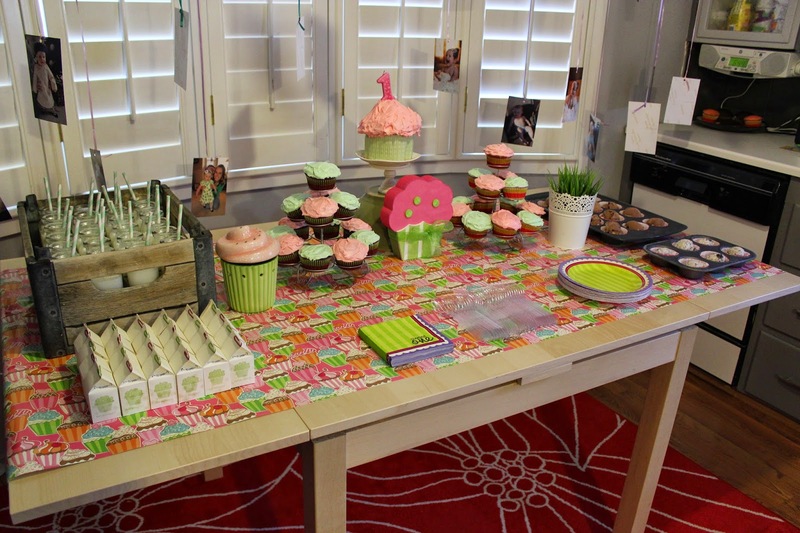 Check out my party planning tips here! I have linked up with The Party Bunch, Monday Funday, Much Ado About Monday, Take-A-Look Tuesday, Too Cute Tuesdays, Party In Your PJs, Show Me What You Got, Look what I made Wed, Hit Me With Your Best Shot, Wow Me Wednesday, Whatever Goes Wednesday, Whimsy Wednesday, Show + Tell, Artsy Corner Thursday, The Creative Exchange, Thrifty Thursday Link Party, Handmade Hangout Party, Creativity Unleashed, Flaunt it Friday, Pinworthy Projects Party, Frugal Friday, Inspiration Gallery Link Party, City of Links, Fabulous Friday Party, The Link Party Palooza, The Creative Collection, Friday Favorites, Linky Party: DIY Inspired, Super Saturday! Um, so I love this! 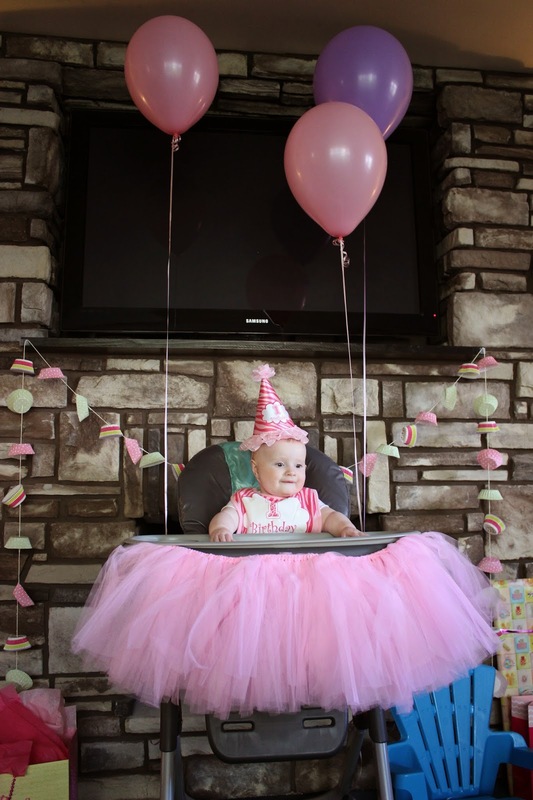 I'm in the middle of planning my kids' first birthday too and totally plan on doing the 1 of photos- I love it! 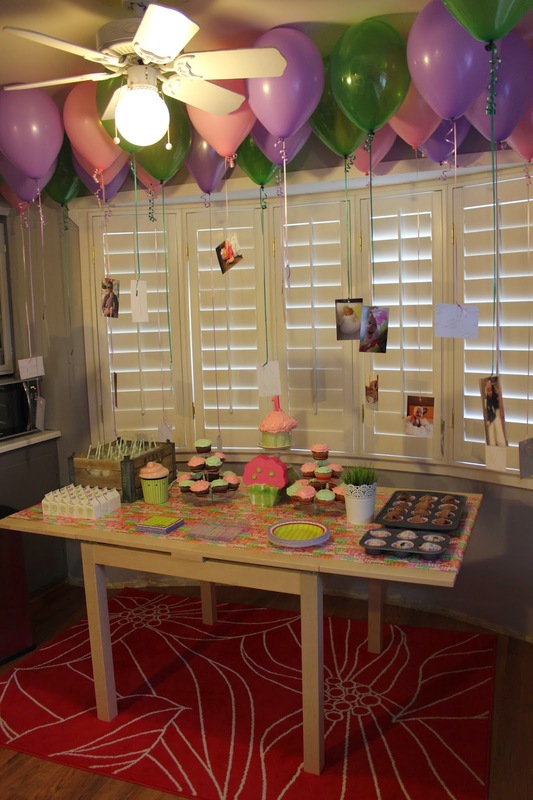 Also, your cupcake liner garland is genius- so simple! Wow. I just read my reply before. I am not functioning on little sleep very well. What I meant to say was: You should do the "1" photos it is so easy. 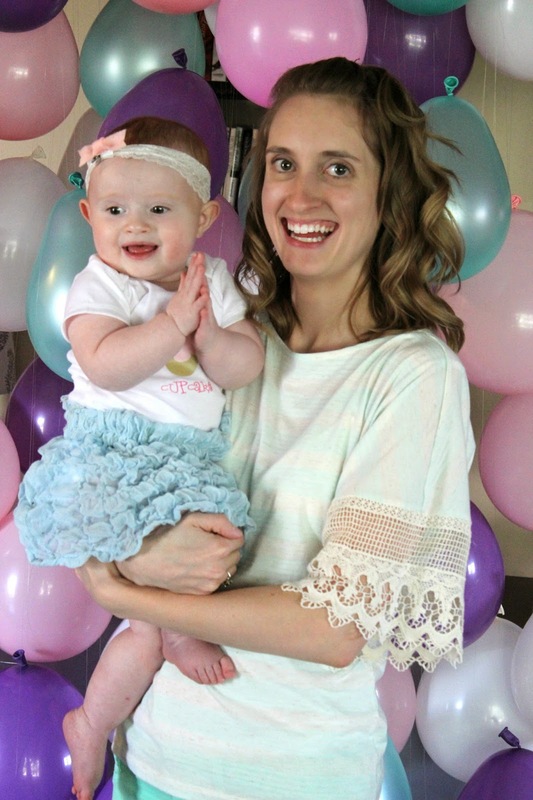 I cannot WAIT to see the party you put together for your littles! It will be so amazing. I know it! Hey also I sent you an email through your blog. Did you get it? 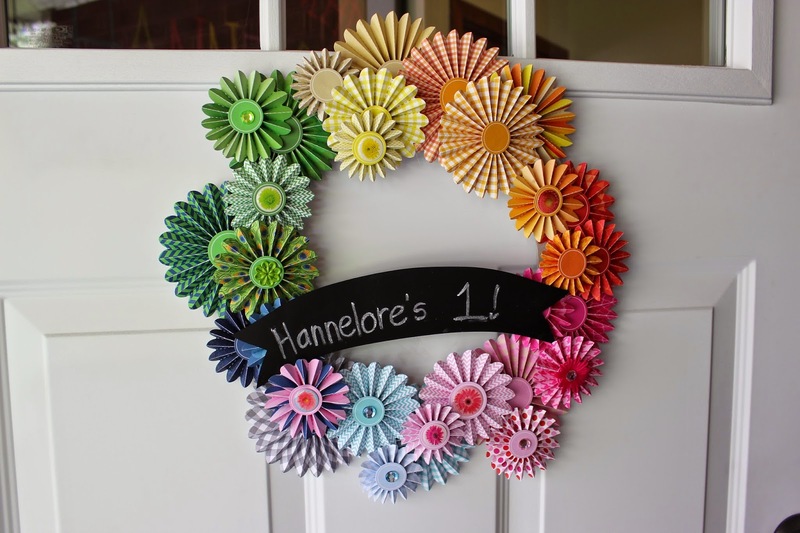 Adorable theme for a first birthday. Everything turned out beautifully! Thank you. It was so fun. That thought scares me! Everyone says enjoy every minute because it passes too quickly. I can totally see that now!